by Kenneth V. Iserson, M.D. 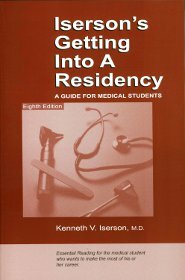 With completely updated information, the 8th edition of this book that has been vital to generations of medical students is a step-by-step guide through the process of selecting a medical specialty and obtaining a residency position. Packed with tips and practical information, this book could be called "How to Get the Most Out of Medical School" or "How to Succeed in Your Medical Career!" This unique book provides invaluable information about all the medical specialties, including the difficulty of obtaining a position and the number of available slots. Numerous charts illustrate the specialty selection process, updated URLs provide additional sources of updated information, and the "Must/Want" Analysis provides a way to rank residency program selections.